Ocasio-Cortez shamefully ATTACKS Dan Crenshaw for pointing out the TRUTH about Ilhan Omar’s 9/11 comment! Yesterday we told you about the attacks being leveled at Dan Crenshaw by Ilhan Omar over her “Some people who did something” comments regarding 9/11. First of all, the quote wasn’t out of context. I checked it myself before I posted on this yesterday. Also, are you kidding me? Dan Crenshaw has done more to fight for this country with this little finger than she’ll ever do in her entire lifetime. And she has the audacity to suggest he’s not fighting for 9/11 victims? He’s exactly right. You can absolutely support and vote for a bill without cosponsoring it. Although if this is a bill crafted by Democrats, there may be very good reason why the bill isn’t worth supporting at all. But I digress. It’s completely offensive for AOC to attack Crenshaw like this when all he did was point out how ‘unbelievable’ Omar’s remarks were about 9/11. He’s not drumming resentment, he’s stating his opinion which happens to be shared by MANY! Good story Right Scoop! Completely agree. Dan Crenshaw should NOT be questioned in regards to his sacrifices and service to his country. Both Ilhar and AOC are leftist enemies of true Americans like Crenshaw. How crackpots like Ilhar and AOC ever got into office is beyond reason. I don’t think this woman is as stupid or ignorant as she is just flat out, shamelessly dishonest. AOC deserves the chutzpah award of the year. Get back to us, AOC, when you have done even half of what Dan Crenshaw has done for this country. Oh, what a shock she’d stand up for the Anti-American/ anti-Semite. Pfft. She may be young but her schtick is getting really old. Her schtick is being stupid. At least that’s all I see from this chic, and yeah, it’s pretty old after a mere (almost) 3 months. We’ll know next year if her district is really this ignorant. They’ve been indoctrinated. My 12 year old has learned about communism in his curriculum and didn’t understand why it’s bad because it sounds like a nice idea, then we give him a scenario wherein he does all the work, his brother is lazy, and they both get the same benefit. They all understand what fair and unfair is. * This is not a public school curriculum. It’s a Christian homeschool curriculum that explained communism as well as capitalism. It’s geared toward understanding and critical thinking, not washing that brain to believe one way. At this point, I’m starting to think think she’s more dishonest than stupid. I do agree with you. That’s why it’s a gimmick. As well as stupid and arrogant. I’m going to point at AOC and tell my daughter that this person is everything you never want to be. An ignorant, spoiled fool. Will somebody PLEASE take this brat to the verbal woodshed!!! She’s a spoiled rotten smarta**s mess and disrespectful to those she doesn’t even come close to being as good as. If anyone was in dire need of a comeuppance it’s her!!! It’s way too late for her to be taken to the preverbal woodshed. She knows little but has been given a powerful platform and is using it to her own peril.” You live by the sword, you did by the sword.” Not my words but ones I agree with in her case. She is indeed an over indulged piece of horse manure. When she does not win re-election in 2020 that’s where she will get what is coming to her. Praying her district wakes up and sees she smells like horse manure as well. Irresponsible or not, progressives are basically a one-trick pony these days. Every political statement is all about demonizing the opposition as hateful and bigoted. I’d almost guarantee that’s the reason Crazy-Eyes thinks she’s taking a “moral” position. Republicans need to push back on the accusations while also correcting the record. These attacks need to be stripped of their facade of moral outrage. Perhaps if she can find his missing eye for him, then she’ll be able to see things more clearly. I’m not sure even then. This brat could have a whole head full of eyes and never see. Alexandria Ocasio-Cortez is a mendacious twit. If you point out shady or despicable things Democrats say or do then it’s always you who are creating divisions or resentment. Everyone who opposes them in any way becomes “right wing” just like the Nazis, you see. They must be allowed to do and say whatever despicable things they want otherwise we’re Nazis. Also, what right wing killings is she talking about? This little ignorant twit has no filter on her empty brain. Every time she opens her horse mouth or tweets she keeps digging her political grave deeper. This blithering twit is an example of the abject failure our education system is in this country. She clearly spent all of her life at the shallow end of the gene pool. Lol… I’m censoring myself. AOC and Omar… POS personified. Oops! Waiting for the #me too crowd to unload on Dan Crenshaw for “creating a hostile working environment” for AOC, Ilhan Omar & Rashida Tlaib while they labor for the betterment of the nation. Never before have I seen such a toxic mix of audacity and outright ignorance. Her and Omar take the cake when it comes to audacity and ignorance. 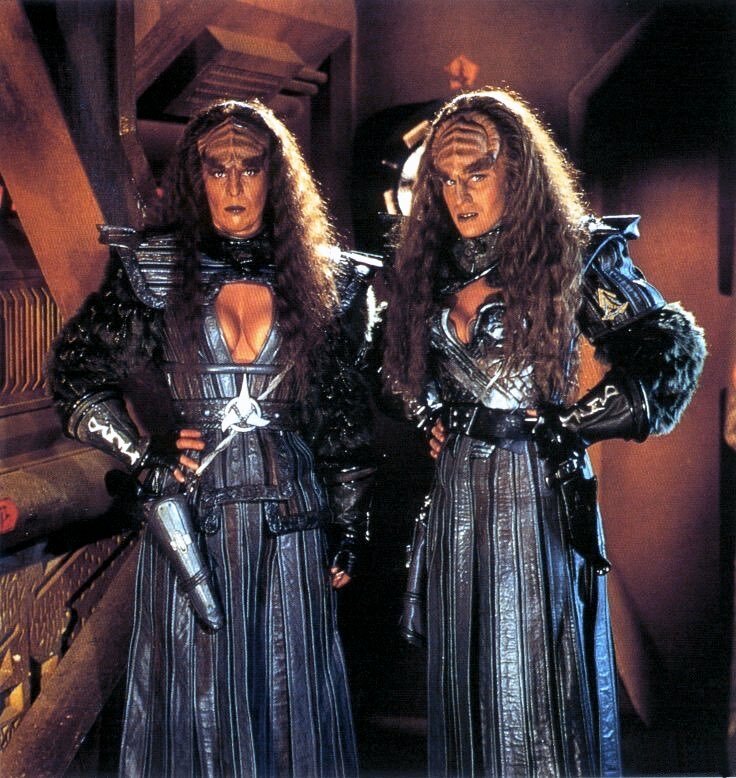 Ok, I’m officially naming them Lursa and B’Etor of the Duras (Dumass) house. Part of me hopes they come to the same end as those sisters did in Star Trek: Generations. That was the only good part of that movie. Lol! And they smell like wet dog too I’m sure. For sure! Lately it’s like Omar farts and AOC is there to sniff it up. Watchman Let’s not leave Rashida Tliab out of the mix since she, Omar and AOC are the three freshman fascist amigos of the democrat party. The “Audacity of Dopes” …to paraphrase a similar book title. Her quote was taken out of context? Ever notice they never say what context it should’ve been taken in? Maybe it’s because that WAS the context of the quote? AOC needs to STFU when opening her stupid loud obnoxious mouth. Scoop? How did you miss this quote from her? “In 2018, right-wing extremists were behind almost ALL US domestic terrorist killings.” How’d you not comment on that asinine twist of facts? PlotEvil We’ll take care of that for him. Well I have to leave something for you guys! Seriously, I was so focused on the other I didn’t get a chance to tackle that. @The Right Scoop We’ve got your back, Scoop. Seth Barron (City Journal): Who Commits Most of the World’s Extremist Violence? Mark Levin brought it up, as well. We all need to be able to slap these stupid claims down under an avalanche of facts. PlotEvil I don’t know why she limited herself to 2018, but if you look at the last several years, most of the “domestic terrorist killings” or mass attacks in this country were done without a political agenda. Except for the Bernie nut who tried to take out a baseball field of GOP Congressmen, and nearly succeeded with Rep Steve Scalise. There have been some truly racist attacks (Savannah black church, Pittsburgh Jewish synagogue) but why are those assumed to be “right wing?” We do NOT own that!!!! Most of the others we just deranged nutcases, about which we may never understand their motivation. Somebody should tell the girls to be careful of their alligator mouths overloading their canary butts…. Oops… too late go get em Dan!